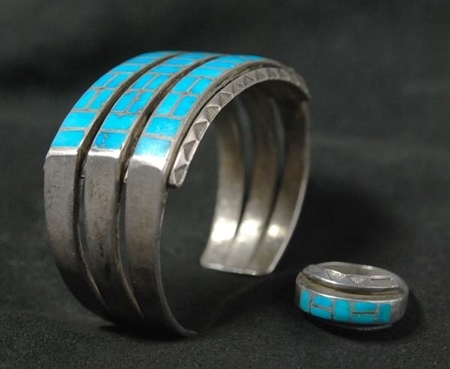 A beautiful vintage Zuni bracelet and ring set. The fine channel inlay and precise stamping, represents a very experienced silversmith and lapidarian, that took care when doing this work. 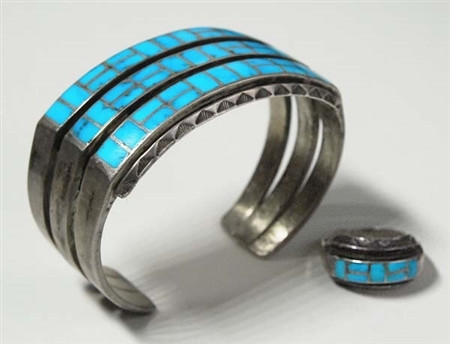 Inlaid with vivid sky blue, natural turquoise. This set is absolutely beautiful on! 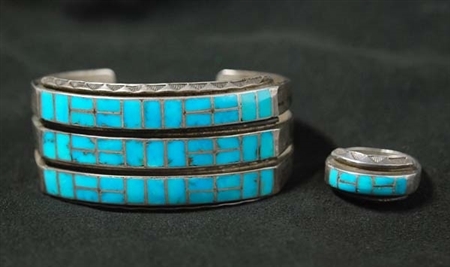 The bracelet measures 1 1/8" wide, tapering to 5/8" at the terminals. The inside measures 5 1/4" with a 1 1/8" opening, slightly adjustable. The ring measures 3/8" wide and is a size 6 1/2. Ring can be enlarged slightly.